Kottke Trucking prides itself in having the best employees in the trucking industry. From office staff to mechanics to everything in between, we are grateful and blessed to have such immense talent as part of our family. We are incredibly proud of our world-class drivers, of course, too. Our drivers are the best you’ll find in the cab or out. One of those amazing drivers that we are immensely grateful for is Laurie Leonard. Laurie has been a ‘Trucker Buddy’ with a class at Sartell Middle School. We’ll let an email we received from the teacher of Laurie’s buddies explain a little more about what Laurie has been doing. Sam: I liked seeing the truck it was cool. Dylan: thank you for letting Laurie bring her truck. It was cool going back in the trailer. Aliya: The nor on Laurie’s truck rules! Thank you for letting her show it to us. Trey: Laurie brought us presents from Hawaii and the truck this week.shes really cool. Jaylee: thank you Laurie for all the visits and letters”,”,!!!!!! Thanks so much for connecting with our classroom this year and making a difference! We at Kottke Trucking are blessed to have Laurie as part of our team. She is a truly special soul. We appreciate all she does for Kottke Trucking and she is a dream representative of Kottke Trucking. Thank you, Laurie. Kottke Trucking’s owenrs with this year’s ALL Mustang winners. From left to right: Kory Kottke, Kurt Kottke, Jake Watkins, Keighly Daak, Kyle Kottke. BUFFALO LAKE, MINN – Every spring, Kottke Trucking teams up with Buffalo Lake – Hector – Stewart High School to recognize one female and one male from the graduating class with the ALL Mustang award. This past Wednesday, May 24, graduating seniors Keighly Daak and Jake Watkins were presented with the ALL Mustang awards at the 6th annual ceremony held at the Zion Lutheran Church in Buffalo Lake. In addition to the award, Kottke Trucking presented both winners with a $500 scholarship. This year’s monthly winners were: Morgan Baldry, Anna Buboltz, Keighly Daak, Dylan Edwards, Jacxl Fernandez, Katherine Hacker, Devin Hansen, Kaitlyn Kottke, Alaina Leske, Brock Luthens, Hunter Ondracek, Ash Petersen, Bryan Schulte and Jake Watkins. 2017 ALL Mustang honorees Jake Watkins and Keighly Daak. Kottke Trucking would like to thank the following for making the ceremony possible: 18 Wheelers Relay for Life team for the meal preparation, Jodi Mellies for the presentation, Dan Krause for being the master of ceremonies, Kyle Depiesse for being our guest speaker and the various coaches and advisors at BLHS who voted for the ALL Mustang awards throughout the year. Another hearty thanks to the friends, family and everybody in attendance for making the event a success. The past ALL Mustang winners include: 2012 – Jessica Kalenberg and Taylor Broderious, 2013 – Carly Schmalz and Baron Juhl, 2014 – Rebecca Ebbers and Christopher Schmidt, 2015 – Ashley Petersen and Scott Buboltz, 2016 – Mariah Paulson and Trey Weispfennig. More pictures from the event can be found on our Instagram page. The 7th annual ALL Mustang ceremony is tentatively scheduled for May 23, 2018. Kottke Trucking has been in business and family owned and operated since 1938. For the past three decades our primary business has been in transporting dry, refrigerated and frozen food items. We operate in the midwest, south and southeastern parts of the United States. Our fleet consists of 150-plus trucks powered by the best drivers in the industry. Kottke Trucking is headquartered in Buffalo Lake, Minnesota with terminals in Eagan, Minnesota and Wildwood, Florida. For more information on Kottke Trucking, go to our website at kottketrucking.wpengine.com or visit us on Facebook. The 2016-17 ALL Mustang monthly honorees in attendance. Front row from left to right: Anna Buboltz, Keighly Daak, Jake Watkins, Kaitlyn Kottke, Brock Luthens. Back row: Hunter Ondracek, Morgan Baldry, Alaina Leske, Devin Hansen, Dylan Edwards, Bryan Schulte, Katherine Hacker. The past ALL Mustang award winners with this year’s winners. Front row from left to right: Jessica Kalenberg, Jake Watkins, Keighly Daak, Ashley Petersen. Back row: Mariah Paulson, Trey Weispfennig, Christopher Schmidt and Taylor Broderius. 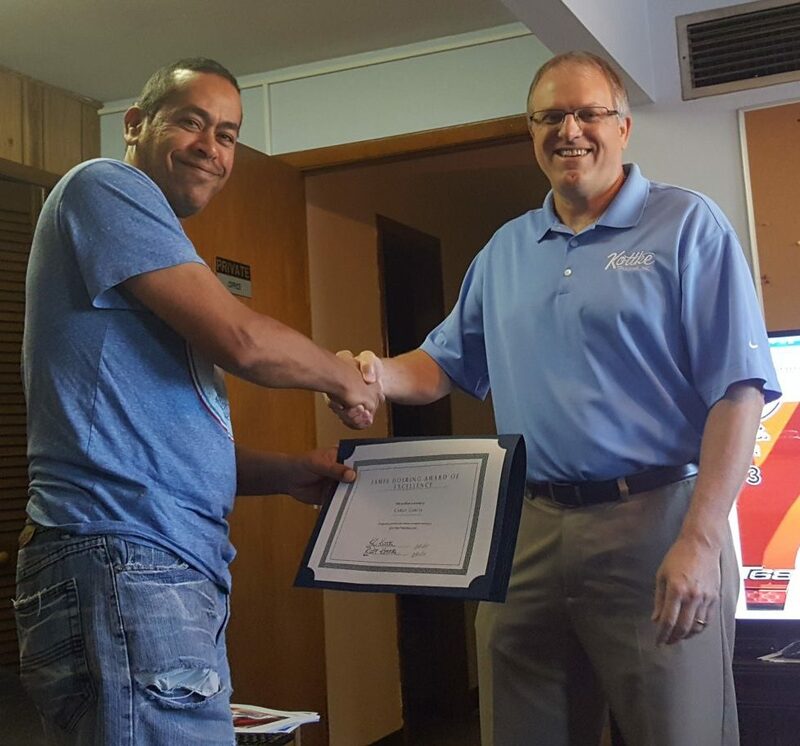 BUFFALO LAKE, MINN – Kottke Trucking, Inc. is proud to announce that Carlo Garcia has been named the 2017 First Quarter Jim Doering Award of Excellence recipient. Garcia was hired by Walbon & Company in July 2014 and has been a great member of the Kottke Trucking fleet since the acquisition with zero accidents and zero moving violations. Thank you, Carlo, for being an awesome part of the Kottke Trucking family! The Jim Doering Award of Excellence was established in 2014 in honor of our first employee and nearly 40-year employee Jim Doering. The award is designed to honor a driver each quarter that has the same great qualities that made Jim such a special man. The four winners of the quarterly Jim Doering Award of excellence are the finalists for the Duane and Connie Kottke Distinguished Driver of the Year which will be awarded in January 2018. The prototypical mental image of a truck driver is a male. There’s a reason for that. Throughout history men have dominated the trucking industry, but that is changing. The amount of women in trucking is increasing, but women still only make up 7% of the total driver population according to the Women in Trucking Association. Comparatively to their male counterparts, women have a lower accident ratio, longer tenure and more total miles per year and per month. In fact, women, on average, put on 52,682 miles compared to 50,344 miles for men. A fact that the trucking industry should be proud of is that there is no gender pay gap in the trucking industry which is something to think about on today, March 8, as it is International Women’s Day. Women have excelled around the world for years in everything that they do, be it trucking or not. Simply, every day should be International Women’s Day. Kottke Trucking employs some amazing women throughout our company. We are thankful and grateful for everything that you do, be it behind a desk or behind the wheel. There’s not enough words to accurately depict what you do to keep the world and the trucking industry running. Thank you. BUFFALO LAKE, MINN – Kottke Trucking is proud to announce the promotion of Ada Brewster to the position of National Sales Manager. In the position, Brewster will be a key part in Kottke Trucking’s setting of planning and execution throughout the United States. Brewster has been with Kottke Trucking since April of 2014 and was formerly the Southeast Regional Sales Manager. Kottke Trucking has been in business since 1938 and for the past three decades the primary business is to transport dry, refrigerated and frozen food items. The third-generation owned company mainly operates in the Midwest, South and Southeastern parts of the United States. Kottke Trucking’s fleet consists of 170 drivers and 30 support staff. Kottke Trucking is based out of Buffalo Lake, Minnesota with offices in Eagan, Minnesota and Wildwood, Florida. On January 7, 2017, Kotte Trucking held its third annual Driver of the Year program at Jackpot Junction Casino and Hotel in Morton, MN. The third annual Duane and Connie Kottke Distinguished Driver of the Year award was given to Jeff Bass. Bass has been with Kottke Trucking since July 13, 2004. He was the named the Second Quarter Jim Doering Award of Excellence winner which qualified him for the Duane and Connie Kottke Distinguished Driver of the Year. Kottke Trucking’s Driver Board created the idea of the Driver of the Year program and it was carried out by our staff. The Distinguished Driver of the Year award is named after our second generation visionaries: Duane and Connie Kottke. Their ability to build the base that our company stands on today, doesn’t go without notice. Bass’ fellow nominees come from the other quarterly winners of the Jim Doering Award of Excellence winners: First Quarter winner James Rogalski, Third Quarter winner Peter Ngeru and Fourth Quarter winner Mike Rapacz. Jim Doering was Kottke Trucking’s first long time driver and stayed with our company for over 35 years. The quarterly awards are named in his memory. Previous winners of the Duane and Connie Kottke Distinguished Driver of the Year Award are Tom Erickson and Rick Pautzke. Kottke Trucking has been in business since 1938 and for the past three decades the primary business is to transport dry, refrigerated and frozen food items. Our third-generation owned company mainly operates in the Midwest, South and Southeastern part of the United States. Our fleet consists of 170 drivers and 30 support staff. Kottke Trucking is based out of Buffalo Lake, MN with offices in Eagan, MN and Wildwood, FL. ‘Tis the season of one very important baby, but also the time of year that brings reflection and joy for many reasons. As 2016 comes to a close, I look back at a year that has been one heck of a ride. One would have never known that making big plans for Kottke Trucking meant now having two terminals and three offices. While we have work to be done, I count my blessings that we have collected a pool of talent that can be the envy of any company in our industry. I will take our team to battle any day. Thank you for all you do. We have a really darn good team and one that I am super proud of. We will achieve some pretty cool things together and I look forward to it. A special thanks to our drivers who make this all possible. Thank you for all the miles, hard work, dedication and time. You are not only what makes this company run, but you make sure that everyone can get everything they need. Thank you so much for all that you do. Whether this Christmas you find yourself taking a sleigh ride in a winter wonderland or dreaming of a white Christmas, being home for the holidays or in the little town of Bethlehem, we sincerely hope that you are not having a blue Christmas because it’s the most wonderful time of the year. From us at Kottke Trucking to kids from one to 92, although it’s been said many times, many ways, Merry Christmas to you. Every holiday season, for over 20 years now, Kottke Trucking has been involved with the Trucks and Toys campaign. The trucking industry from around the state of Minnesota comes together to collect toys that are given to children in need. Kottke Trucking alone this year collected and donated over $5,000 of toys. Kottke Trucking donates these collections to three charities in outstate Minnesota: Santa’s Closet of Renville County, Common Cup Ministries and the McLeod County Christmas Project. We are proud to have our office in Buffalo Lake be a drop off site for these toys. We collected over $4,000 of toys and cash donations and Kottke Trucking donated another $1,000 to that to get to our grand total of $5,033. The reach of our Trucks and Toy donations did not stop in Minnesota this year. With our recent acquisition of a terminal in Wildwood, Florida, we saw a need to also help those in need in the state of Florida. The charity we worked with in Florida is the Florida Sheriffs Youth Ranches. This program takes at-risk children and places them in one of six different locations throughout the state of Florida in a true home setting. Through the donations of drivers and employees of Kottke Trucking, we were able to donate six 54” Spalding basketball hoops, one for each location of the Florida Sheriffs Youth Ranches. We are incredibly thankful for all the generous donations of toys and cash that have helped us have a successful Toys and Trucks campaign this holiday season. Thank you for helping us spread holiday cheer for over 20 years, it truly makes this the most wonderful time of the year. Marlene Hamblin with Santa’s Closet volunteers dropping off toys at the Santa’s Closet location in Danube, Minnesota. Kottke Trucking, Inc. is proud to announce that Mike Rapacz is the 2016 fourth quarter recipient of the Jim Doering Award of Excellence. Rapacz has been driving with Kottke Trucking since April 2014. Thank you, Mike, for working hard and giving your 100% to Kottke Trucking. It is a pleasure to have you on the team. The Jim Doering Award of Excellence was established in 2014 in honor of our first employee and nearly 40-year employee Jim Doering. The award is designed to honor a driver each quarter that has the same great qualities that made Jim such a special man. The four winners of the quarterly Jim Doering Award of excellence are the finalists for the Duane and Connie Kottke Distinguished Driver of the Year which will be awarded on the first weekend of January. There was a point in my life where you had to remind me that Thanksgiving was more than turkey and football. Sadly, I missed the point and forever thankful that I found it. Professionally, there is so much to find to be thankful for. The list starts with our drivers, team, customers and key vendors. There is no doubt that the year of 2016 brought changes with the addition of another fleet but we are glad you are part of our team. In many ways we think we have been quite lucky. We found a great group of drivers and personnel that we added to our already great team. In a staff meeting about a month ago, I told the operations team that I don’t remember a time that we had so much talent as now and that is the truth. While our team is ultra important, our customers pay the bills and our vendors keep us moving; it would be remiss of me not to put extra focus on our drivers. These men and women in our fleet are some of the best in the industry. Thankful, blessed and hopeful are three adjectives that come to mind. I am thankful for all you do. I am thankful to have such a darn good team. I find having you as part of our team as a blessing. I am hopeful that together we will continue to do great things. To you, I say thank you. Our center core value is family values. We tell everyone who asks that we have the biggest family in Buffalo Lake (and now Wildwood) because you are part of it. As the last year has been slightly hectic, I have to say that family is what kept my center. My lovely wife and daughters teach me at every visit to the house or call, that they are center. I had a wonderful time in 2016 being part of the Ernst and Young Entrepreneur of the Year program. While humbly surprised we passed through four stages to make it to the national level, got to wear a tux on two occasions and met tremendously wonderful, talented and nationally known people – the true highlight for me was the opportunity to spend time with my brothers. As our business has grown, we spend most of our time together as partners and not nearly enough time together as brothers. Having our beverage of choice and talking anything but business, even if for just a moment, was truly the highlight of my rewarding experience. God has blessed me with you as part of my life. And to you….I want to say thank you. PS – go Vikings and pass the turkey.